Gripsweat - Bobby & Dave - Build My World Around You UK Ackee 7" Listen! 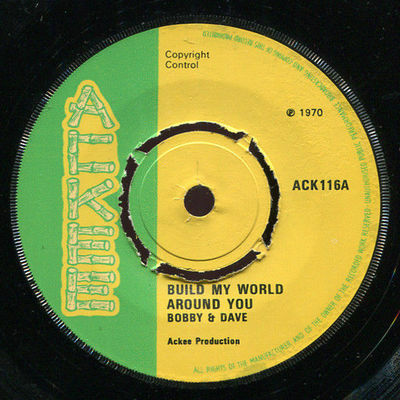 Bobby & Dave - Build My World Around You UK Ackee 7" Listen! A message to all our customers!!! We want you to be happy with your trading with us, we try our best to make this happen but we are also a busy shop and cannot attend to eBay during the day. If you have ANY problems, please come to talk to us FIRST and allow us time to respond, we are here to help you. This week: A truly mixed bag this week, dominated by a bunch of very sweet 12"s, most of which are in tip-top condition, and many in original sleeves as well :-) Also some classic 45's and a rare dub-plate!. 1970 Ackee ACK 116 ACK 116 A1-△ H / ACK 116 B1-△ H Vinyl EX- clean, trace scuffs Our auction items are cleaned on a Vpi HW-27 Typhoon Record Cleaning Machine! Labels EX clean Sleeve etc VG+ plain sleeve click on the images to enlarge! scans are always of the actual item for sale! to hear a sample taken from this item. The A side is a reggae version of the Uniques song, the flipside is a DeeJay-cut to "Sammy" by Bobby & Dave - which we are also selling this week if you want the pair! Nice clean copy. Please read everything before you place your bid! We charge for the shipping cost. We only charge what it actually costs. Our shipping prices are posted below. We do not charge for packaging. Insurance is only available with premium shipping services which can be arranged if you wish. Please remember that it is your choice! We cannot be held responsible for items damaged or lost in the post. If you have any questions please be sure to ask them before you bid! Thank you. x2 = 2.30 x2 =3.70 x2 =4.75 x2 =5.05 x3 = 4.30 x3 = 3.70 x3 =4.75 x3 =5.05 x4 =4.30 x4 =5.15 x4 =7.45 x4 =7.90 x5 =4.30 x5 =5.15 x5 =7.45 x5 =9.40 LP / 12"
Terms must be agreed before bidding. We reserve the right to remove bids from buyers with low feedback. Get in touch if you need to! Payment is by Paypal only! (eBay users without Paypal cannot bid on our items). However you may also come to the Camden Town shop in person. Please ALWAYS wait for your invoice, especially if you have won multiple items because we may need to calculate the shipping. If you require insurance, please let us know first. Payment must be completed within 7 days of end of auction (or items may be re-listed). Please contact us before bidding if you cannot do this. We do not automatically refund for accidental damage or loss in transit. We can only leave positive feedback (or none) but we think good buyers should receive good feedback. In return we try to provide the best service and we ask that you leave positive feedback for us if you are happy with our service. Remember it's still voluntary! This is more than just an add-on, it's a method to enforce sellers to trade to eBay standards. Buyers can give sellers marks for 'item as described', 'shipping time', 'shipping cost' and 'communication'. VERY IMPORTANT Sellers are required to maintain an average of over 4.5 stars for each category. This means that anything less than a 5 star rating actually counts against the seller (though you may not have meant it to). This is not made clear to buyers so that's why we're telling you now. Shipping cost: Our prices are clearly marked on the table above and you should not have any complaint about that after the sale. Item As Described: We try our best to make our descriptions accurate but mistakes can happen. We GUARANTEE our items, so if you have any problem we will refund you. Shipping time: We try to ship on the next available posting day but we are a busy shop and this can't always happen. We will let you know if there is any significant delay. Please take into consideration any public holidays, etc. Communication: We try to respond immediately but we are a busy shop. The eBay part of our business is conducted OUTSIDE shop hours therefore some communication may be delayed. Please take this into consideration when asking a question or when leaving a rating. We would consider it rude if you go straight to eBay or Paypal before contacting us. Remember eBay are not selling you this item; WE ARE! Any refunds or claims for damage will have to come from our pockets. If for ANY reason you are unhappy with our service, or if anything goes wrong, please contact us first and we will try to solve the problem together. We're here to help you. We want to keep you happy so please contact us with any questions at any time. Thanks to all our customers! We love you.